With its mild year-round climate, walking around Portugal is one of the best ways to find those nooks and crannies that otherwise you would never get to know. Around city streets, crossing fields or strolling along the beach, walking tours could have set starting points and destinations or simply enable you to go wherever the whim takes you, just for the pleasure of walking along and observing whatever comes your way. For guidance, you can use maps, or follow the indications left on the ground by the footsteps of those who have been there before you. But there are also signposted footpaths, with approved, well-defined routes that offer security to all who follow them. They are approved by the Federation of Camping and Mountaineering, the body responsible for these matters. According to their length, they are classified as Great, Small or Local Routes. The Great Routes (GR) all cover more than 30 kilometers and some even extend to other countries; they are trans-European, such as the Atlantic Way (GR-E9) which starts in St. Petersburg in Russia and crosses the whole of Europe. Small Routes are less than 30 kilometers long, and are typically set in one municipal area, and Local Routes just cover short distances. Walking is an activity well within the reach of anyone who just needs to follow the signs on the ground to not get lost. 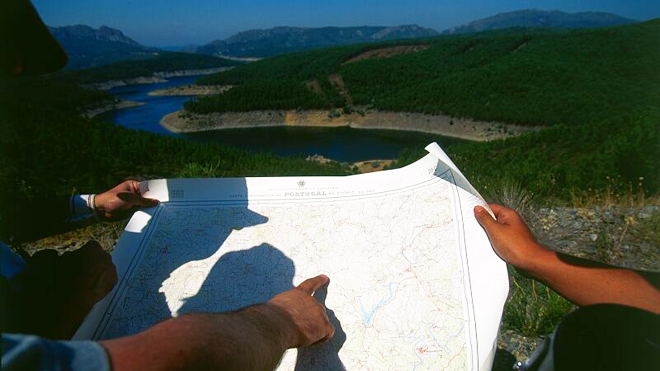 For added peace of mind you can take other kinds of guide, such as the detailed large scale maps of each area produced by the Portuguese Geographic Institute. Or a traditional compass or other apps available on a mobile phone, as well as guidebooks and itineraries with information to complement what you can see. You can combine your walk with the search for small "treasures", practicing geocaching with the indispensable aid of GPS. Fundamental to all this, though, is that your clothing and footwear should be comfortable and suitable for the climate and the terrain. And as you cannot always rely on the availability of establishments that serve food and drinks, you should bring water and some snacks. It may be possible to participate in an organised activity, following footpaths with experienced guides who have already explored the terrain. They set the pace and lead the way, calling attention to the points of interest and hidden details along the way. There are varied suggested routes that enable you to fully enjoy the walk without worrying about the practical aspects, and to better deal with the efforts needed manage the trip. So when you reach the end of the day, you will be more ready to enjoy the excellent cuisine of each region and the comfort of a fine guest house. Walking is a relaxing and enjoyable activity, which can be combined with the joy of seeing panoramic landscapes or nature in all its detail, from flora and fauna to geology. Or you can enjoy the heritage, the typical architecture of each region, and its traditional activities. In many cases, the paths themselves also have a heritage value, since some follow the old Roman roads, where you can still see the milestones, many of them very well maintained. Others are the mediaeval roads used by early kings in the Christian re-conquest, or the paths taken by pilgrims to Santiago de Compostela, which are still today followed by many on a journey combining the discovery of the territory and of yourself. Whichever option you choose, there’s nothing like leaving the main road and following the tracks and dirt roads, the footpaths trodden by country folk who know the area and the terrain they cross. These are paths that have a practical use, for example for leading the cattle to the pasture, or for crossing ravines, or circling scrubland or rugged hillsides, and they will lead you sometimes to absolutely stunning places. You can also trace old disused railway lines that have been transformed into Ecotracks with excellent conditions for sports. 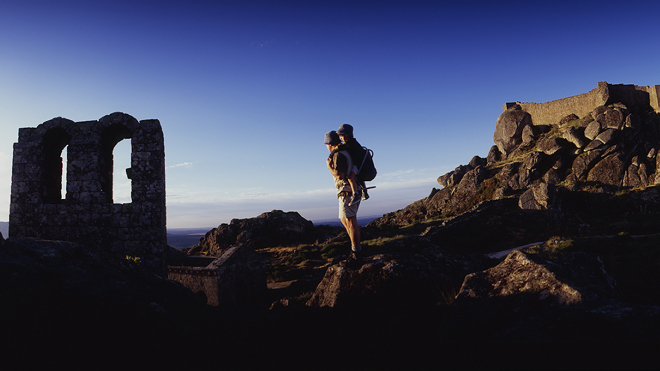 In the north, walks in the protected areas are recommended, such as the Peneda-Gerês National Park, or the natural parks of Montesinho or Alvão, or the Arouca Geopark, that lead to the discovery of village communities and traditional knowledge. Or get to know the heritage, by following the Romanesque Route or the St. James Way. 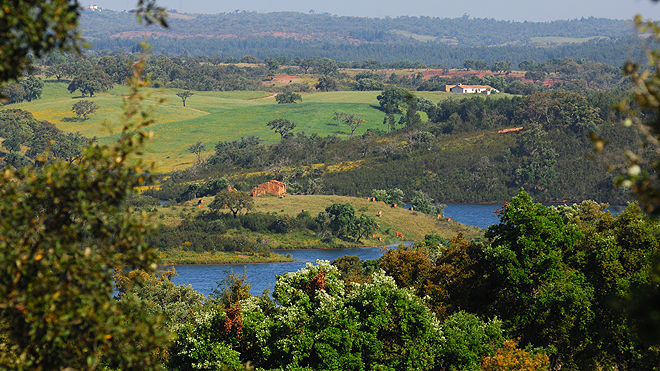 In Central Portugal, it is the grandeur of the mountains that marks the landscape. 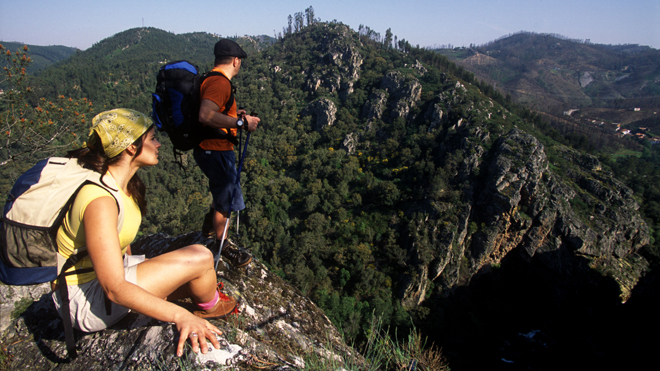 The Estrela, Lousã and Caramulo mountain ranges offer many possible routes to take to be at one with nature. But also their people and their villages, like the groups of Historical Villages, Schist Villages and the preserved area of the Naturtejo Geopark. Some footpaths follow rivers and streams, sometimes up to their sources in caves deep in the earth, such as in the Aire and Candeeiros ranges. Further south in the Alentejo, there are walks for everyone on the hills and plains, through the cornfields or carpets of flowers. But there is also an important heritage to discover - from castles to isolated chapels, and even the archaeological evidence of the distant past, with dolmens and menhirs. In the interior of the Algarve, the Via Algarviana crosses the region from east to west, showing off its lesser-known features that are still very much attached to a rural way of life. On the island of Madeira there is a network of footpaths that follow the "levadas", the man-made canals built to irrigate the land; and in the Azores there are numerous trails that run through the interior of the islands around lagoons and caves, plunging into nature in its pure state. With its long coastline, Portugal has many footpaths overlooking the sea. They offer fantastic views, sometimes so dizzying and imposing that they take the breath away, and they also have the added appeal of the aromas and freshness that come off the ocean. Some are signposted, such as the Vicentina Route, which stretches for kilometers between the Alentejo and the Algarve. 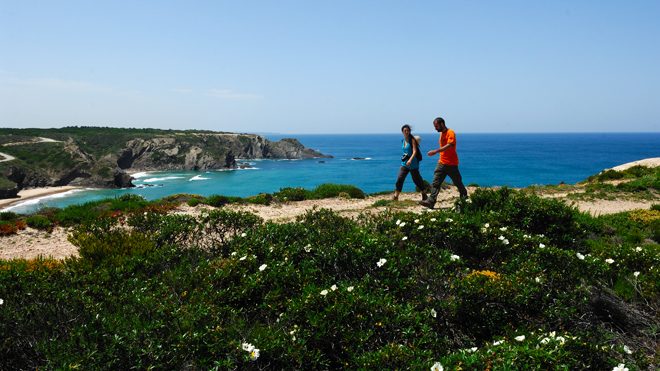 Between Porto Covo and Odeceixe there is a trail that follows the access paths to the beaches and fishing grounds right at the edge of the ocean, and another longer trail runs a little further inland between Santiago do Cacém and Cape São Vicente in Sagres. 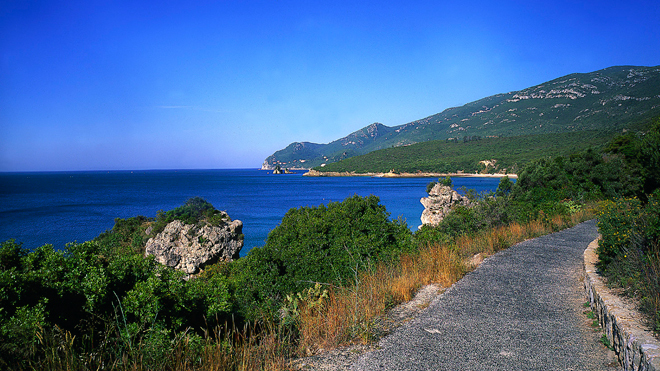 Further north, in the Arrábida Natural Park, you can follow a network of tracks that allow you to enjoy landscapes in which the shades of green of the hills harmonise with all the blues of the ocean, providing images of unforgettable beauty. Here there are true natural sanctuaries to be found, some under full preservation which are not open to visitors, others that can only be visited with an expert guide. Across the River Tagus, the Sintra Mountain is another area not to be missed for its preserved nature that UNESCO has classified as a cultural landscape and where, beyond the lush greenery, there are numerous palaces and estates that make for mandatory visits. From the hilltops, the views over the sea are stunning, but go down the mountainside to try out the route along the coast that goes via Guincho and the beaches of Sintra, to enjoy the waves from close up. 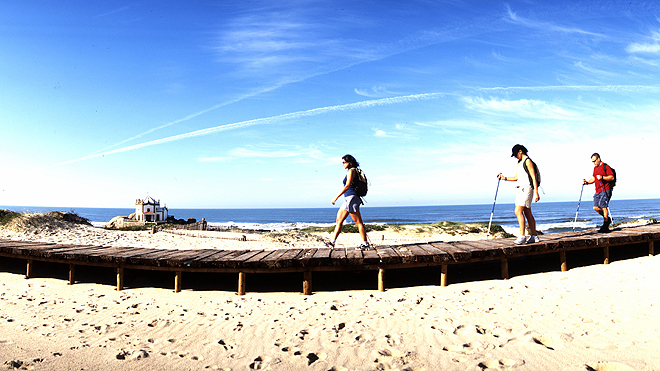 In Central Portugal, there are numerous footpaths that can be taken to breathe in the sea breeze. The possibilities on the west coast are endless, from close to the beaches of São Pedro de Moel and Pedrogão, along the vast expanse of sand at Figueira da Foz, or at Ílhavo, between the Ria (Aveiro’s tidal reach) and the sea. Further north, there are long footpaths alongside the beaches at Espinho, Vila Nova de Gaia, Matosinhos, Esposende and Caminha, which are excellent options for those who like to walk with the sea for company. In Madeira, too, there are trails for everyone, but we would highlight those on the island of Porto Santo, along its 9-kilometre sandy beach, or those that soar up to the highest peaks to enjoy the majestic views. 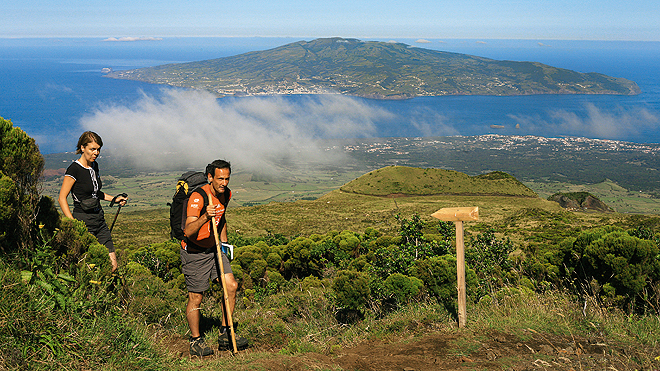 In the Azores, the sea is always on the horizon, but those who want to get closer must follow the paths that lead to the fajãs, plots of land that spread out to the Atlantic and are witness to the volcanic origin of the islands.